I’ve been craving this smoothie for weeks. I knew I wanted something creamy and comforting with just a touch of coconut. I saw a recipe similar to this, except without the peaches. I don’t actually love coconut when it’s the prominent flavor, or pineapple, for that matter. But they both make wonderful “back flavors”. I added in a few peaches to round out the flavors and it came out wonderful. The peach flavor was very mild and it did the trick of balancing the other two fruits. This is probably the quickest and easiest smoothie I’ve made so far. Granted; it isn’t “green” but it’s still good for you. If you enjoy something on the sweet side for breakfast or a mid-day pick-me-up, this is the one for you. Mildly sweet, perfect with a piece of peanut butter toast for breakfast. 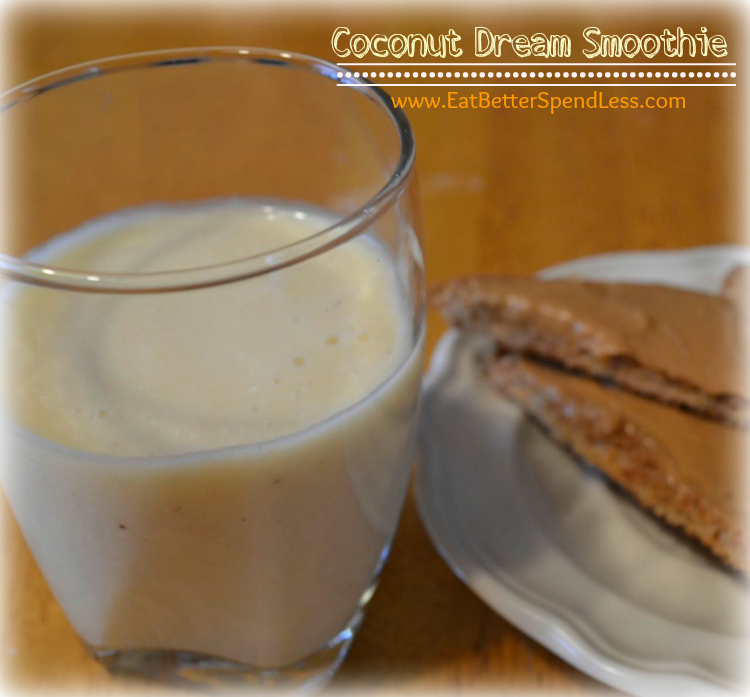 1 TBSP unsweetened coconut (if you can’t find it, sweetened is OK but your smoothie will be pretty sweet. If none of your fruit is frozen you may want to add a few ice cubes. This recipe makes one serving of about 5-6 ounces but you can easily double it. **To make this recipe gluten free, use gluten free oats. I will just love your Coconut Dream Smoothie, it looks awesome. Thanks so much for sharing with Full Plate Thursday and enjoy your weekend! Thank you for bringing your delicious smoothie to Family Fun Friday! It looks GREAT! Blessings to you!